The concept of mobile payments is steadily gaining ground in business. Small business owners will be increasingly under the gun to have the necessary infrastructure in play to take that field on, and LevelUp will prove to be one more potential app for small business to handle in the form of LevelUp. LevelUp, recent beneficiary of a $9 million bout of funding from Deutsche Telekom’s venture capital division, T-Venture, now has a hefty $21 million in its war chest and a little extra executive firepower in the form of Randeep Wilkhu, Senior Manager of T-Venture, who has joined the board as an observer. That’s going to give the young company a lot of extra staying power, staying power it will need against a growing number of competitors. But what else does LevelUp have in its favor? 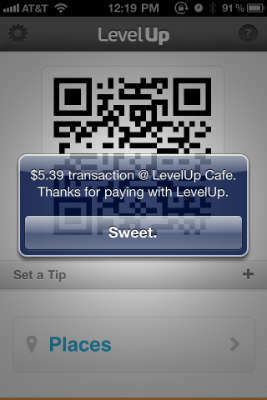 While LevelUp may be a startup, it’s not just getting started. 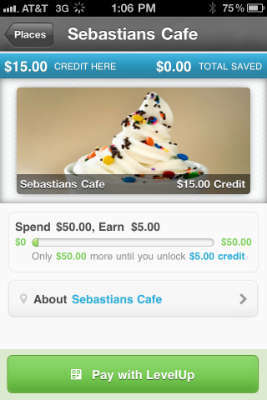 The app itself can be used with fully 3,000 different merchants, including Ben & Jerry’s, Johnny Rockets, and Quizno’s. There are over 200,000 users so far, and they’re spending a combined total of $2 million per month with LevelUp. LevelUp is also looking to expand, set to hit 50 different cities by the end of 2012, with plans to hit major national chains before winter fires up in earnest. It’s not just mobile payment tools that will help make a small business grow, either; cloud-based telephony tools will go a long way toward making that happen, including local numbers and call hold and transfer services, which allow potential customers to get a hold of a small business much more readily. This in turn makes a business more likely to bring in more customers and, from there, profit. LevelUp may not be the mobile payment system of choice for most small businesses, but it’s certainly one to consider, and one that may be one to include in an overall strategic view. This entry was posted in Phone Apps, Sales, Small Business by Steve. Bookmark the permalink.